Earlier this month I showed you my Fabric Baskets for the Boys. 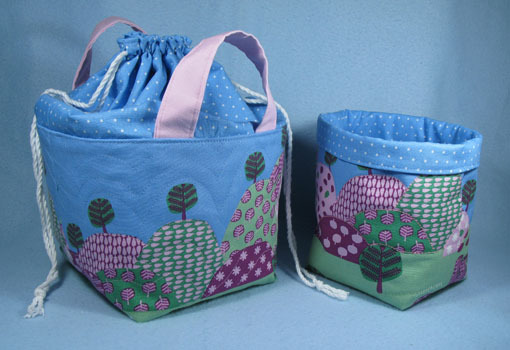 This time I've made a girlie set of baskets, using the beautiful Saffron Craig fabric, Magical Lands. I was lucky enough to match the blue with a polka dot from my stash. 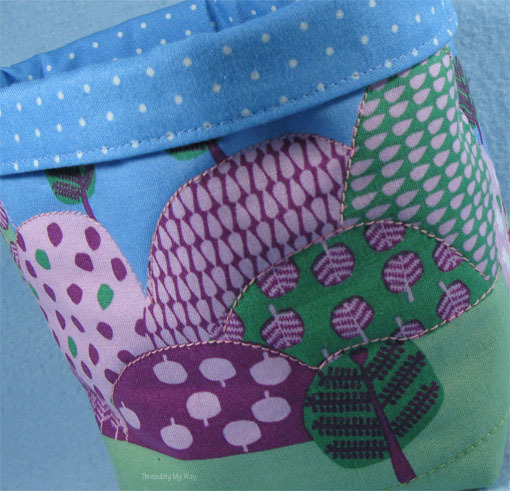 Once again, I've modified the Scrappy Fabric Basket tutorial, to make one the same as my small, car fabric basket. I've used three different coloured threads to do the quilting. The green is just a few, random straight lines, mainly hidden underneath the basket. The pink roughly follows the shape of the mountains. and is from an old reel of Sylko thread, actually made in Australia. All of the blue is hidden under the folded top. Trust me; it is there and its curves follow the shape of the mountains. 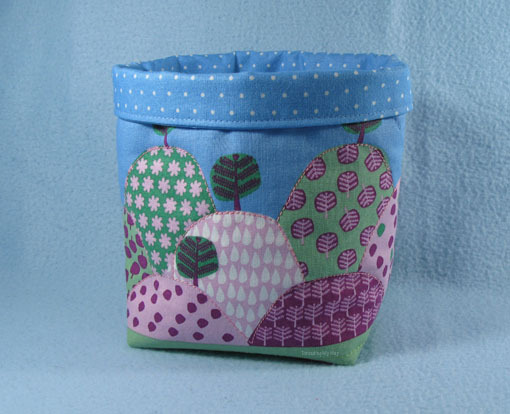 This is my favourite of the two, another drawstring top fabric basket. I'm hoping to have the tutorial for these baskets written by the end of the week. 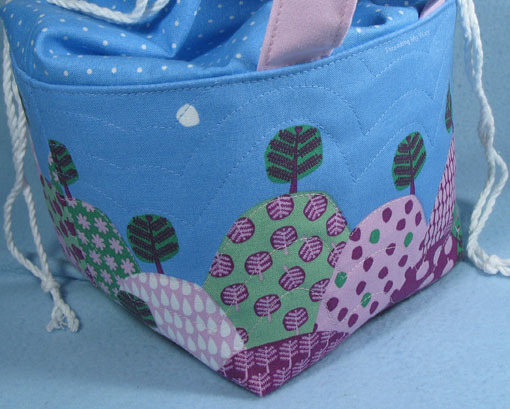 The quilting is more or less the same as on the smaller basket, with the exception of the pink thread. I didn't have enough of the old Sylko thread and have used a thinner thread, the same as for the blue and green. I actually prefer the more subtle effect of the thinner thread and I've added extra lines. I can now cross another two items off my Christmas list. I'm on the lookout for girlie goodies to pop inside these baskets. If time permits, I'll make a couple of hair accessories, but I'm not sure yet what else. I have a whole month to decide. Edited to add: I've now written a tutorial to make the Drawstring Top Fabric Basket. Oh Pam , this are little works of Art.. These are so lovely Pam. Just goes to prove how important a Proper Stash is, so you can, for example, match polka dots to sky when required! I really, really like these. When I get a break from what I'm sewing now, I'd like to make some for my girls! Pam, I totally agree with Mirjam: this is Art! I love the drawstring bag, will be looking out for that tutorial Pam! Are the intended recipients old enough for friendship bracelets, or even just the supplies to make their own? That fabric is adorable. It's perfect for these sweet baskets you made. I love homemade Christmas gifts. I am sure they'll be a huge hit. Your baskets are sooooooo beautiful. I love the fabric!!! These are just lovely, the fabric is gorgeous! Has the tutorial for the drawstring basket been posted? Did I miss it??? Love the baskets. Great for so many things. 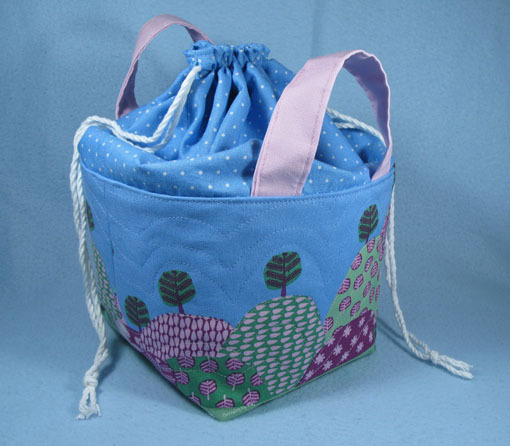 I was thinking they would make lovely yarn bags especially for traveling. I've been a bit slow with the tutorial. It's half written... hopefully finished by the end of this week.